Hey Guys! 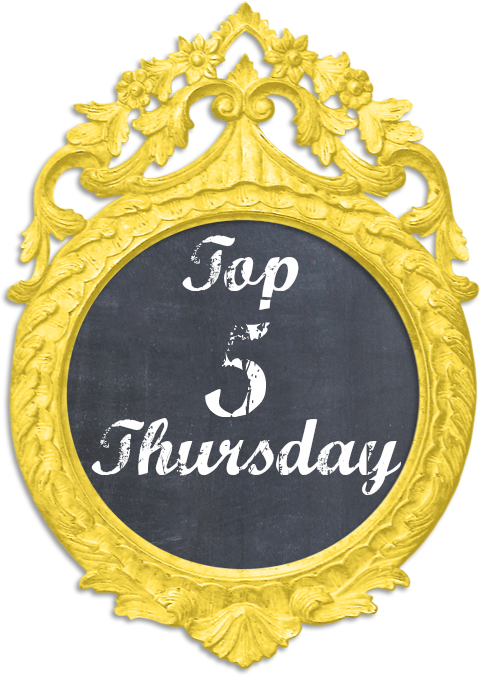 Welcome to my first ever First Impression Friday! If you aren't aware of what FIF is, it is just where I test out a product and give you my first impressions. 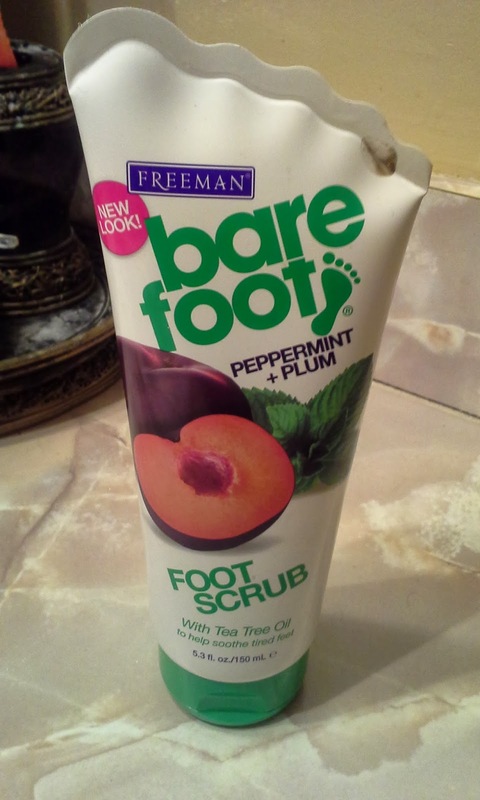 Today I am going to talk to you about the Freeman Barefoot Peppermint + Plum Foot Scrub. I got this product quite a while ago but never got a chance to use it. My feet have been super dry (along with the rest of my skin) because of this crazy weather. I decided this was a perfect time to give this stuff a try.This stuff claims that it will invigorate while exfoliating the rough, dry patches. It also says that it has Tea Tree Oil to soothe and relax tired feet. It says to use it all you have to do is massage on feet with your hand, loofah or pumice stone. And you are supposed to focus on the rough areas. It comes out a slight purple color and you can easily see the exfoliant in it. It smells amazing. I'm not sure if it is the tea tree oil in it, but it almost smells like a salon shampoo. You can also smell the peppermint in it just slightly. I started by soaking my feet in my tub for just a minute. Then I did each foot one at a time. I applied about a quarter sized amount to my foot. 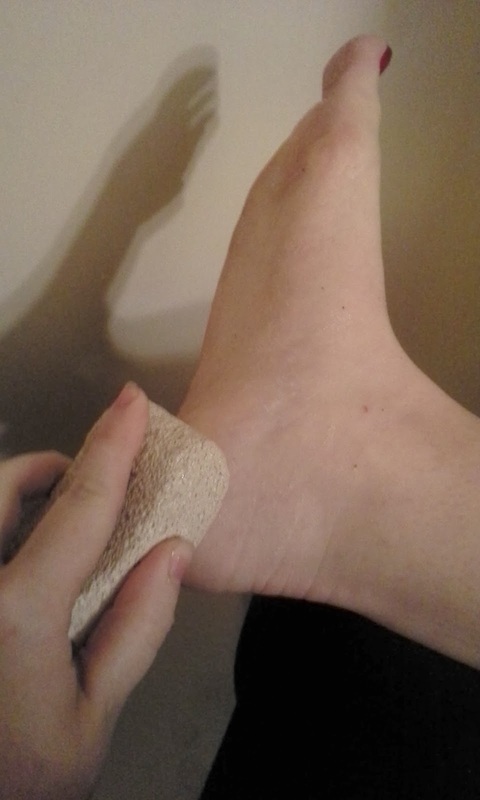 I massaged it in with my hand first, and then came in with my pumice stone and focused on the dryer parts of my foot (mainly my large toe and the heel of my foot). After I finished one foot, I let it soak in the water again and did the other foot. When I finished both feet, I added just a tiny bit more of the scrub and massaged it in one more time. Then I rinsed both feet. This is the before of my foot (EEEWWWW!). And here is the after. You can see a huge difference between the two pictures. I really did enjoy this stuff. It made my feet feel really smooth. I really want to try some of the other scrubs and the foot lotion. I was really impressed this. It didn't totally smooth my feet out, but I feel like if I continued to use it and used a foot lotion with it, it would. It did an amazing job on my extremely dry feet. I really recommend it! And at less than $4 a bottle it is a huge bargain! How do you care for your feet? Do you use a foot scrub? If so what kind do you use? Let me know!